After several years in the making, I present to you: My Etsy shop! I might be a little biased, but isn't it pretty? I may also be exaggerating just a smidgen about it being 'years in the making', unless years of procrastination are considered a legitimate part of the process. A few days in the making would be more truthful, though woefully less dramatic and worthy of drum rolls. I'm starting out by selling hand-painted baby onesies (seen above) in addition to selected prints of my original artwork. The onesie idea came to me after I painted one for a friend's baby shower and she kept delaying putting it on her baby for fear that the design would be spoiled after washing it. Eventually my assurances were taken to heart and it made it through the washing machine (successfully! ), but not before it sparked this idea, which I liked for its practicality (babies always need onesies), as well as the appeal of having sentimental, original artwork once they outgrow it. Each onesie is designed and hand-painted by me, and although they follow a pattern, they are all unique. 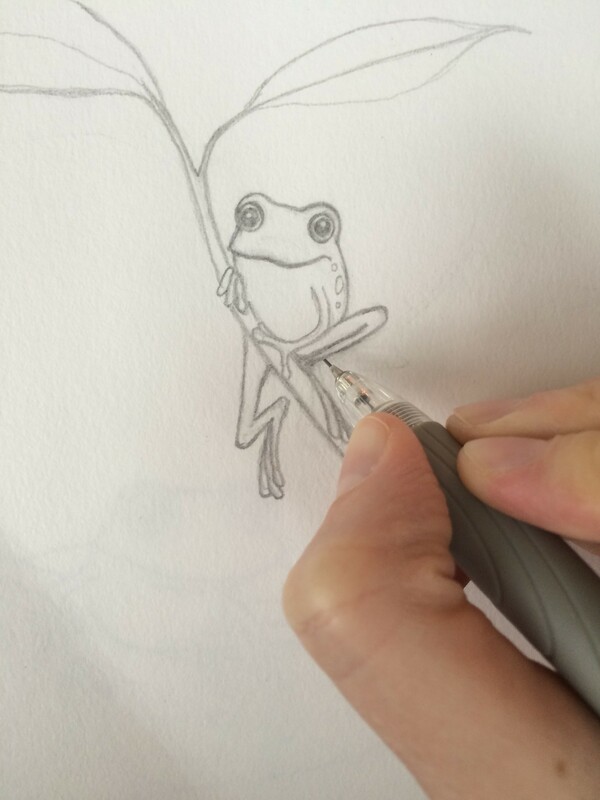 My process starts out with a sketch: After finalising the drawing in pencil, I scan it and size it to fit on the onesie, and then trace it onto the cloth using fabric marker. Ideally, this would be done using a light table (or at least a glass table with a light under it). Lacking this, I just tape mine onto a rectangular piece of glass, fasten it with clips, and hold it over a lamp - demonstrating both ingenuity and class. 😉 Painting on a onesie can be a bit trickier than on canvas, as the material isn't primed, and little bits of cotton fluff tend to get stuck to the paintbrush. This is most likely to occur when I'm trying to paint a detail, such as a sparkle in the eye (crucial, as that is how you can tell it's alive). After about an hour, the onesie is completed and ready to be given to a lucky little one. 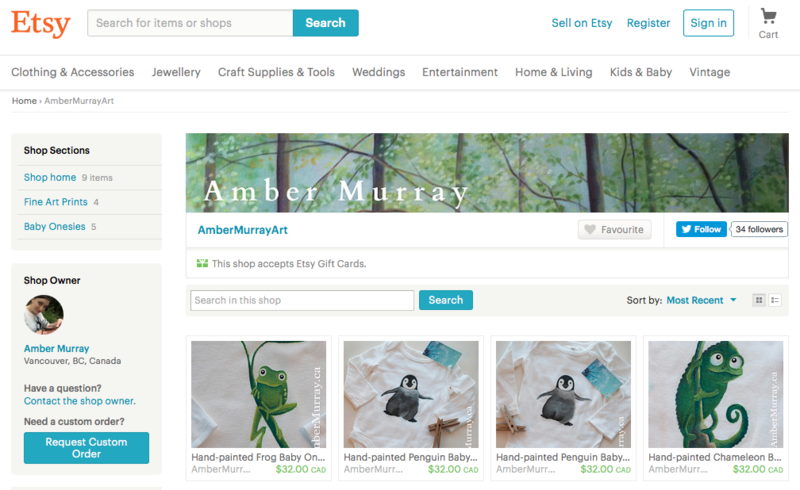 My shop is called AmberMurrayArt, and can be found here. Posted in Uncategorized	| Comments Off on Oh hello, gorgeous.